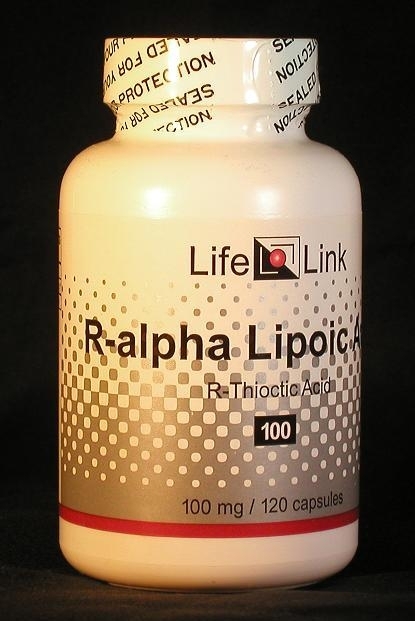 R-Alpha-lipoic acid (R-ALA) is a cofactor in several biochemical processes in the body, including the process by which energy is extracted from carbohydrates. It is also an antioxidant that neutralizes several kinds of oxygen radicals and related molecules — destructive byproducts of the body’s own normal metabolic activities. Thanks to its antioxidant properties, R-ALA is nature’s most powerful defense against oxygen-gone-wild. Can a single substance really have such a wide range of beneficial effects? Yes it can, because it works at a fundamental biological level, reducing damage to a wide range of structures inside of cells. Since ALA competes with vitamin B7 (biotin) for access to certain enzymes and molecular transporters, it would be sensible to take a biotin supplement if one is supplementing with R-ALA.
Alpha-lipoic acid (ALA; also known as ‘thioctic acid’) is a substance made by cells of many kinds — bacterial, plant, and animal. There are two forms of ALA: R-ALA and S-ALA — the R-form is the one found in nature; the S-form results from synthetic production of ALA in which both forms are made in equal amounts. Supplements are available containing either the R-form alone or a 50:50 mixture of R- and S-. ALA is also an antioxidant that neutralizes several kinds of oxygen radicals and related reactive molecules, including hydroxyl, peroxyl and superoxide radicals, singlet oxygen, hydrogen peroxide, hypochlorous acid, peroxynitrite, and nitric oxide. Several of the body’s other antioxidants can be regenerated by ALA: vitamins C and E and glutathione.2 These antioxidant properties make ALA nature’s most powerful defense against the ravages of ‘reactive oxygen species’ (ROS). Many good review articles about ALA are available, but most of them are under the control of unscrupulous scientific journals which charge outrageous fees to read them. Of the reviews freely accessible on the Internet, we recommend the Wikipedia article1, the review on ALA and cardiovascular disease by Wollin and Jones2, the review on ALA and exercise by Sen and Packer,3 all of which are somewhat technical but contain many passages useful and interesting to non-technical readers. The review on ALA and peripheral neuropathy by Head4 and the excellent review by Kidd5 on neurodegeneration, dementia, and aging are considerably less technical. Accordingly, we will limit our discussion of alpha-lipoic acid to a brief summary of relevant research, and let you draw your own conclusions about what medical conditions it may be effective in treating. Let us look at several of these applications in a bit more detail. Many studies have been conducted to test ALA on diabetes-related neurological conditions, such as neuropathy460 These studies have utilized tissue culture,24 lab animals,61 and humans.23 Many of the older clinical studies used intravenous injections of ALA solutions; while these experiments have generally shown significant benefits, they are essentially useless as clinical trials since daily intravenous treatments are impractical in most cases. The research money would have been better spent on studying oral ALA treatments. and retinopathy. Fortunately, more recent studies have tended to use orally dosed ALA — and have also shown significant benefits. Since ALA competes with vitamin B7 (biotin) for access to certain enzymes and molecular transporters, it would be sensible to take a biotin supplement if one is supplementing with ALA.65 A dose of a few milligrams of biotin per day should be adequate. The biotin should be taken at a different time than the ALA supplement, since they compete for absorption. Is alpha-lipoic acid useful for the conditions and purposes mentioned above? We aren’t allowed to tell you, so you should take a look at some of the references cited here, and then decide for yourself. Removal of ferritin-bound iron by DL-dihydrolipoate and DL-dihydrolipoamide. Eur J Biochem. 1986 Mar 3;155(2):295-300. Bonomi F, Pagani S.
 Molecular aspects of the removal of ferritin-bound iron by DL-dihydrolipoate. Biochim Biophys Acta. 1989 Feb 2;994(2):180-6. Bonomi F, Cerioli A, Pagani S.